What irks or annoys you—-causing you to mutter unhappy complaints? Is it incessant cell phone chatterers? Gas prices? Fake people? Traffic? These are just a few of the many frustrating nuisances that we often find ourselves venting about daily. In Complaint Box the personal or observed complaints of approximately 30 artists amass on the walls of VOICE 1156. Regardless of whether the issues that dissatisfy the artists are shared and relevant to others, or trite and possibly nagging, the focus of this group show is to visually portray personal gripes or the overheard grumblings of family, friends, and society. 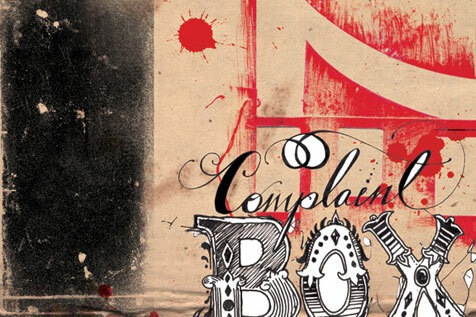 Similar to the way that complaints, when expressed often enough, can consume an individual’s outlook on life, the compilation of various objections will quite surely consume viewers as they consider the painted, drawn, and photographed submissions of Complaint Box. Neko, Kevin Peterson, Faceless™, Shane Varaiya, Chandu Reading, MEOW, Poor Al, Sergio Hernandez, Persue, Ruets, Spurn, Regis, Ramen Death, Mike Maxwell, thatkidpeep, DieKutz, Wendy Teague, Boss Hog, Archie Leroy Dean IV, Huero, Zac Parks, Christina Liu, Adam Hawthorn, Exist 1981, Brent Sandor, Bob Lajes, Matt Stallings, Ben Horton, Tyke, Robust, No. 2, Spencer Little, Rey Gregorio, Monica Hoover, and Robert Pardue.